Well, this is one of the strangest team-ups I've ever seen: Square Enix and Ubisoft have partnered to bring the world of Assassin's Creed to the world of Final Fantasy 15 via free DLC coming August 31. In the DLC, players will be able to dress Noctis and the gang up in Assassin robes, climb towers, make leaps of faith into bales of hay, and more. It's all part of the "Assassin's Festival" coming to FF15’s town of Lestallum. Which, uh... okay, that sounds like a weird thing to celebrate and make an event out of, but you do you, FF15. It's not clear what the festival is supposed to be about, but a trailer makes it look like you'll be evading and fighting against Imperial forces spread throughout the city. 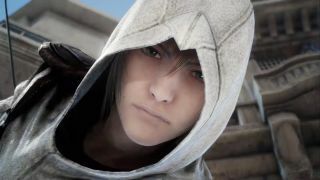 If you've obtained the Dream Egg from the Moogle Chocobo Carnival event, you'll be given a special Assassin outfit for Noctis modeled after Altair's robes from the first Assassin's Creed. Complete activities at the festival and you can earn another Assassin costume as well - that one being more similar in appearance to the ensemble worn by Bayek in Assassin's Creed Origins. "This collaboration is the result of being huge fans," Assassin's Creed Origins director Ashraf Ismail said over on the Ubi Blog. "There’s a lot of respect between the two teams and we couldn’t be more thrilled with the opportunity to pay homage to each other’s work." What do you think - is this weirder or not as weird as that time Assassin's Creed crossed over with Metal Gear Solid to let Old Snake wear Altair's outfit and have Ezio run around in Raiden's cyborg body?